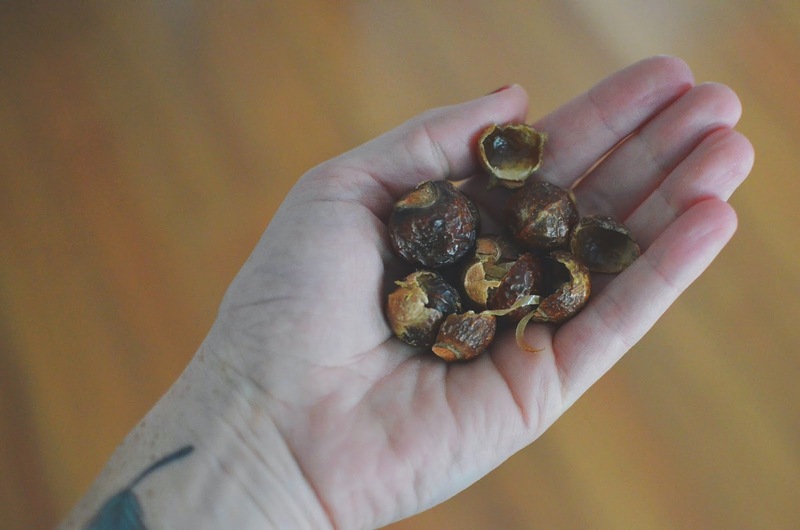 SOAPNUTS, you guys! I love them. They had been on my list to try and I've had them in my online cart since forever, but finally got to them this week. They are amazing little cleaning powerhouses. Soapnuts are no new thing. Ancient tribes were using soap nuts waaaaay back in the day. They're like original hipsters saying,"we've been using these for like a thousand years whatever." The soapnuts grow on a tree and are in the lychee family. The saponins are actually held in the hulls and as a natural surfactant, can serve a ton of purposes. Among the multitudes of listed uses is removal of freckles. WHAT?! The horror... Actually, the 12 year old me would have been all over that. 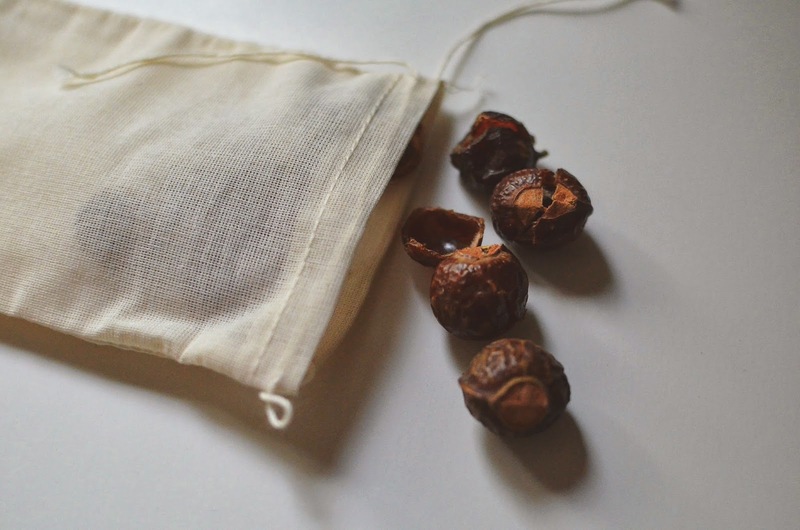 I ordered my soapnuts from Mountain Rose Herbs. MRH is like a candy store for me. If you have any herbal needs, they probably have what you're looking for and then some. They have speedy shipping and great customer service. You can find soapnuts a lot of other places too, I can only speak from my own experience. The best soap nut resource I have read is this one from Crunchy Betty. I tried a couple of boiling methods for rendering the soap nut liquid, but hers was the most effective. 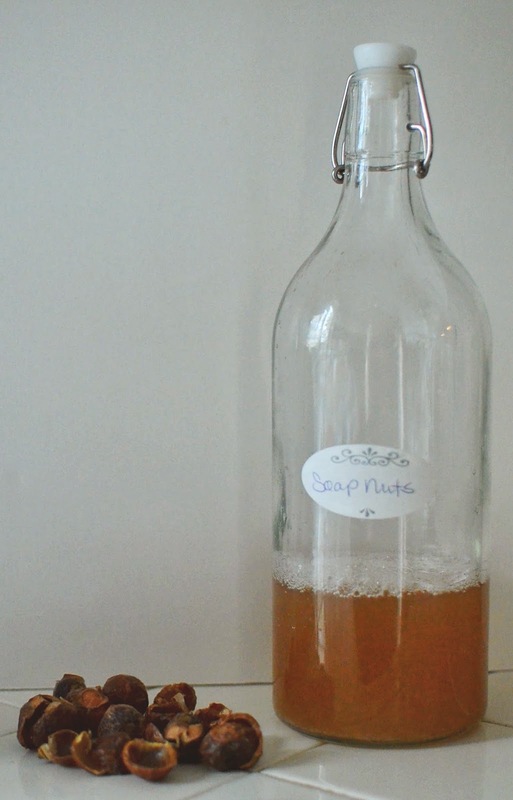 Also, the Mountain Rose Herbs blog posted this awesome article about using soapnut liquid for laundry. I have used the actual hulls and the liquid for a few different jobs and am looking forward to trying a lot more. I used 5 hulls in a muslin bag in my HE front loading washing machine. It's really that simple. I threw the bag in the wash with the dirty laundry and that's it. I got about 7 loads out of one batch and was impressed with the ease, cleaning power, and my clothes smelled super fresh. Using the liquid works great as well and a little goes a long way. I used about 1/4 cup for a full load and my clothes were clean and soft. I just used the liquid as a countertop spray and it worked great. It busted through all grime my children inflicted on our dining table and got drips and spills off my cabinets and counters without any problem at all. I think I will add white vinegar and some tea tree or lemon oil in the future just to give it an extra punch. My hair is not normal. I have tried all manner of diy hair methods, poo free, vinegar, baking soda, aloe, honey, EVERYTHING and my hair comes out crazy dry and frizzy. The soapnut liquid was definitely the least drying of anything I've used before, but I think I have to stick with good old shampoo and conditioner. I am trying not to look like that girl from Brave. That being said, there are countless women online that swear that their hair is amazing with soapnuts. I leave it to you to decide. I used this as a face and body wash and it worked out splendidly. I gave the bottle a good shake before using and just scrubbed with a loofa. KEEP YOUR EYES TIGHTLY CLOSED. It burns like crazy if you get it in there. You've been warned. There are a multitude of other uses, these are just the ones I've tried. Are you interested in trying soapnuts? Do you use them already? Share your favorite uses/recipes with us please!